The visual shows the top contenders according to The Power Rank. This list gives the odds for all 32 teams. For those interested in my methods, see the end of this post. But first, some quick thoughts on a few teams. The host nation Brazil has the highest win probability at 36%. Home advantage plays a big role in these large odds. On average, the home team scored about 0.56 goals more than the road team over the last 3 cycles of World Cup qualifying. As discussed in the book Scorecasting, referee bias plays a big role in home advantage. In last year’s Confederation Cup final, Spain tried to execute their short passing game against the home nation Brazil. From my perspective, the referees let Brazil get away with fouls that stymied Spain’s attack. Brazil won 3-0. But Brazil also plays some magnificent soccer as the top ranked team in The Power Rank. Their young star Neymar will dazzle you with his quick feet and skills. The other traditional soccer power from South America, ranked 3rd in The Power Rank, has the second highest win probability at 10%. Argentina benefits from a weak group with Bosnia-Herzegovina, Iran and Nigeria. I like to call it Group of Eternal Life. They have a 85% chance to advance to the knock out stage. Argentina might also benefit from a home continent advantage. It’s much easier for Argentina fans to travel to Brazil for the World Cup than nations from Europe. Enough fans in attendance could create a home advantage effect like Brazil will enjoy. I did not include a home continent advantage in my model, so Argentina might have even better odds than 10%. Expectations are different for the United States. Surviving a tough group with Germany, Portugal and Ghana would be a huge achievement. My numbers give the Yanks a 38% to make the knock out stage. Those are decent odds for the 20th ranked team in the world. I also looked at their ranking when including only games with Jurgen Klinsmann as coach. Despite all those goals they scored in last year’s Gold Cup, the United States only rises to 17th. The road to winning the World Cup gets harder in the knock out stage. The United States has a 1.1% chance to win the World Cup, 15th best out of 32 nations. However, Connecticut had a 1.5% chance to win the 2014 NCAA men’s basketball tourney by my numbers. They beat Kentucky to win an improbable title. Here’s the truth: If you want the most accurate predictions about who will win the World Cup, you shouldn’t just look at my predictions. One system is not enough. Research has shown that better predictions arise from aggregating many predictions. This was a key finding in a recent academic paper on using rankings to predicting football matches. Yeah, it’s a blow to my massive ego. 🙂 But you deserve the best possible predictions for the 2014 World Cup. I’m curating World Cup predictions from other sources. Next week, I’ll aggregate these predictions for my email list, since they’re my favorite people in the world. If you want to see those results (and you really should if you’re in any kind of World Cup pool), sign up for my free email newsletter. It’s the best way to get updates on The Power Rank’s content. Still reading? Thanks, you’re the best. 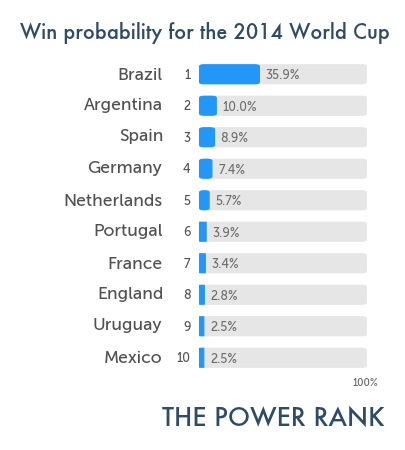 The World Cup win probabilities start with The Power Rank’s algorithm for ranking teams. It takes margin of victory in matches and adjusts for strength of schedule. With the wide disparity between countries in international soccer, this adjustment is critical for predicting the World Cup. This algorithm can not only rank teams but also the offense and defense of each team. This allows me to estimate the goal rate for an offense against an opposing defense. To predict the outcome of a match, I pick a Poisson random variable according to these goal rates per 90 minutes. This model says a team has the same rate of scoring a goal at any point in the match. For example, teams score 1.34 goals per 90 minutes in international play. This implies that a team has a 1.4% chance to score a goal during any minute. For each minute, you could flip a coin that comes up heads 14 out of every 1000 flips. Repeating this flipping 90 times and counting the heads is the same as getting goals from a Poisson random variable. To simulate the World Cup, I use this Poisson model for each match in the group stage. To see the predictions for all 48 matches, check out the predictions page. This model gives not only the winner or loser of each match but also a score. The scores allow for the calculation of tie breakers, which consider goal differential and goals scored. The same Poisson model applies in the knock out stage. If two teams are tied on goals after regulation, the model is applied again for extra time. I assume each team has a 50-50 chance to win penalty kicks. The win probabilities arise from counting the number of times each team wins over 10,000 simulations.